Years ago we found GeGeek.com (Credit goes to Rick over at What’s on My PC) and realized that the website and Toolkit was an unreal resource and treasure for young IT Professionals. First and foremost I am not the original developer of GeGeek that was Mike. Mike actually retired from living in the USA and moved to ASIA, GeGeek was to be buried. When I came along I started helping Mike with the website which was completely different and once I took over I started migrating to a new server and updating a lot of the content from the old schema to the new. The toolkit itself needed a massive overhaul since a lot of the software that was originally with it was either outdated or even contained crapware that the developers didn’t care. So the introduction to shift out a ton of software and bring the toolkit into a later stage with new content. The other downside was the toolkit was originally distributed with everything included, so every 2 weeks a 1.7gb file was uploaded, not only did this cause havoc on the server but people often complained about the file being corrupted. It was at this time when Mike left that I thought that the toolkit needed a change, I can’t upload 1.7gb, internet in Australia wouldn’t cope lol, so I stripped out the contents then started again, it still wasn’t enough. I’ve stripped back the toolkit now 18 times and no longer a zip file but now an installer. Run, Install, Done. Every 3 months a new update is released. I got into computers when I was about 14 and I started computer programming, Visual basic, then Machine Code, Cobol, Fortran, before moving back to Visual Basic. A few years later VB.NET was my new hunger and today strongly using .NET. Outside of GeGeek I am also a game developer writing on my PC game, yet again more programming and outside of that I am a Computer Technician in a retail store, solving customers riddles with Malware/Spyware and setting up new PC’s. In the beginning updating the software was time consuming, plus you can’t hotlink to many websites since they forbid it, it was easier for some applications to just host it on our SSL Server, that way I can update everything on the fly. Its amazing how much old equipment I still use as well as new equipment to keep ahead of the times, when VR first came out I jumped onboard with the Oculus, that was several years ago and today I am using the HTC Vive, it’s a fun toy. For anyone studying IT, keep at it, if you’re interested in any sort of programming, get in there and learn, there are so many different places out there online that offer programming assistance that its all free to learn. Depending on what direction you want to go with IT its a real game changer out there in the world and technology for the world is only just starting, what you learn today you could be one of the people in the future living on Mars or Saturn building a better future for tomorrow. Thanks Jason for allowing us to evaluate and test the Kit! We’ll continue to pass this great resource on to hundreds of young IT professionals at our college and we’ll continue to evaluate it over the years. BackBox is more than an operating system, it is a Free Open Source Community Project with the aim to promote the culture of security in IT environment and give its contribute to make it better and safer. BackBox Linux is a penetration testing and security assessment oriented Linux distribution providing a network and systems analysis toolkit. It includes some of the most commonly known/used security and analysis tools, aiming for a wide spread of goals, ranging from web application analysis to network analysis, stress tests, sniffing, vulnerability assessment, computer forensic analysis, automotive and exploitation. It has been built on Ubuntu core system yet fully customized, designed to be one of the best Penetration testing and security distribution and more. How do I get it? You can get it here. Does it co-exist with Windows 10? Yes, if you install it, it will detect your Windows Version and make a DUAL boot system that allows you to select BackBox or Windows. BackBox.org, in partnership with the most innovative cybersecurity companies, offers a range of Penetration Testing services to simulate an attack on your network or application. OK, how do i update it? Go to the menu, System, Software Updater. Enter your password when prompted. Want to analyze your network? Some of the top filters for Wireshark are below. This by no means is a user guide for Wireshark which is the best freeware protocol analyzer available. Want to see if your traffic is efficient? Use the following filter to identify problems in your traffic. This flag helps to look at problems you may have in a trace file. By using this filter, you can see re-transmissions, acknowledgement problems and more. Are you experiencing latency in traffic to a server? Are you being SYN attacked? This flag can help you detect syn based attacks against a server. While thousands of packets may be found, it is the pattern of syn requests that can indicate if you are being attacked by someone. Troubleshooting a connection? Do you know the port number for the application? TCP Spurious Retransmissions may be seen from time to time when using Wireshark. How do you see them? 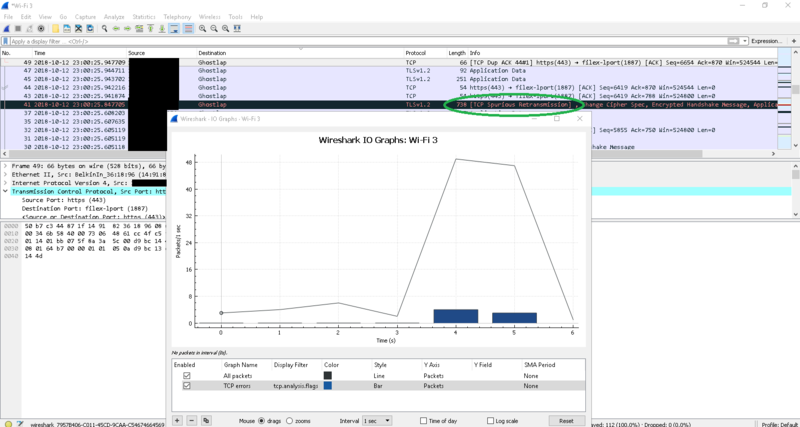 Capture some data with Wireshark on your workstation or server. Click on Statistics, IO Graphs and click throughout the graph on the color that indicates TCP errors. You’ll see the Wireshark main screen change to the point in time you are clicking. Analyze the content and look for Spurious Retransmission. These packets may indicate that the sender sent a retransmission for data that was already acknowledged. TCP will show some packet loss, so these are normal events. If these are common, they may start to impact application and/or performance across your network. Here’s what you can do. Look at the path between devices and your server. Look for ethernet errors, discards, possible high utilization. This may indicate wireless or cabling issues. How can you correct too many of these? Disable everything on the server network card with the exception of flow control – under the Advanced tab. Look at driver updates on hardware (remember, if you update drivers, your network card advanced properties will reset). Look at your switch utilization. Look at adding a second card on your server. There’s always some kid out there better at hacking than a Russian team over seas. Even the rich and intelligent can be caught. Satellite communication is referred to as one of the most popular communication technology used for global communication. Its applications are vast. Military intelligence, Broadband internet service, and weather forecasting are its some most popular applications. The satellite dish network internet Wi-Fi is supposed to be the best solution for getting internet in the rural areas. Although its advantages are vast still security in the satellite communication is a significant concern. There are many limitations. 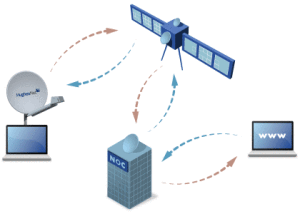 For example, power control, high link delay, and link availability are some of the standard security issues on the satellite internet. 10 simultaneous connections according to Computerworld. What should you try first? – Try the PowerShell post we made on an earlier date to check for updates.